1. The history of in-car infotainment likely started with the car radio. 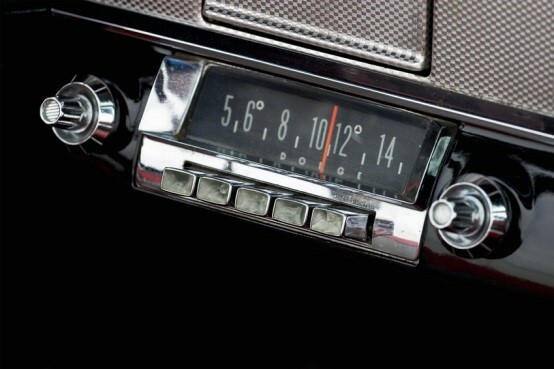 The first car radio was probably installed in 1922. For the decidedly hefty price of $200, Chevrolet installed an in-car radio whose antenna covered the whole roof, with a large battery under the front seat and big speakers in the back. Needless to say, customers were eager for a less cumbersome system. During the following years, smaller and more convenient in-car radios entered the market and car radio caught on in a big way. 2. Navigation is one of the things that has been around much longer than we usually think. Manufacturers have been toying around with in-car or portable consumer navigation devices since the early 1980s, although the early systems were not very accurate. The first built-in GPS navigation system was available in 1995 in the Oldsmobile Eighty Eight, already equipped with voice output and sold for a whopping $2000. However, both built-in and portable devices only really caught on with the availability of more precise GPS signals in the year 2000. Since then, navigation systems have become a key component of many car infotainment systems. The data has become more and more accurate and is being connected with real-time information from other cars and the infrastructure. EB provided navigation for the first fully connected solution in Daimler cars as early as 2003 and is continuously evolving its EB street director solution to support many other infotainment and driver assistance functions, to the point of autonomous driving. 3. Have you ever heard of the In-Car Inventory System? Well, to be honest, it doesn’t exist yet, but there could be a market for it. In 2004, working parents were asked by HP Laboratories to envision what in-car functions could support them in their daily life. One of them was the In-Car Inventory System that keeps track of all that daily routine stuff like your kids’ PE kits via RFID and alerts you if they’re not in the car with you if they should be. Not a bad idea, is it? 4. Also in 2004, BMW was the first carmaker to offer iPod integration for their cars. 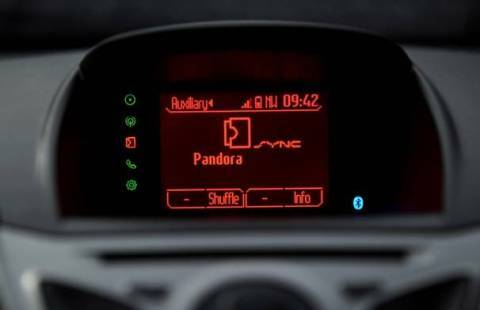 What started with the simple use of an external device as a music archive really laid the foundation for a major trend: Nowadays, we expect to be able to connect our smartphones and integrate not only music, but also external, connected and updatable content into our cars. More about that in this great history of in-car entertainment. 5. In 2007, speech interaction systems appeared in cars. At that year’s Geneva Motor Show, Mercedes, Fiat and Ford all introduced cars sporting a voice interaction system. In 2007 EB also introduced Voice Destination Entry for PND navigation devices. However, cars have been talking to us for longer than we realize. As early as 1983, the Austin Maestro and the Renault 11 both came with a voice output system that was able to alert the driver regarding certain situations e.g. buckling up or closing the doors. 6. 2007 saw the introduction of Ford Sync, Ford’s integrated in-vehicle communications and entertainment system. It is able to connect with mobile phones so the driver can control them via the in-car system, and includes nifty applications like Vehicle Health Reports and 911 Assist. EB has been involved in the development of Ford Sync almost from the beginning. 7. Touch and multi-touch user interfaces are also a very recent addition to the infotainment system. The first touch interface in a series production car was introduced in 2010 as a key feature in the new Audi A8. The A8’s whole HMI was implemented by EB and modeled with EB GUIDE, then in version 4. 8. In 2011, the European Commission ruled that an emergency assistance service (named eCall) must be part of every new vehicle in Europe from October 2015 on. In case of an accident, the system will automatically alert the local emergency agencies, transmitting information like coordinates and direction in the process. 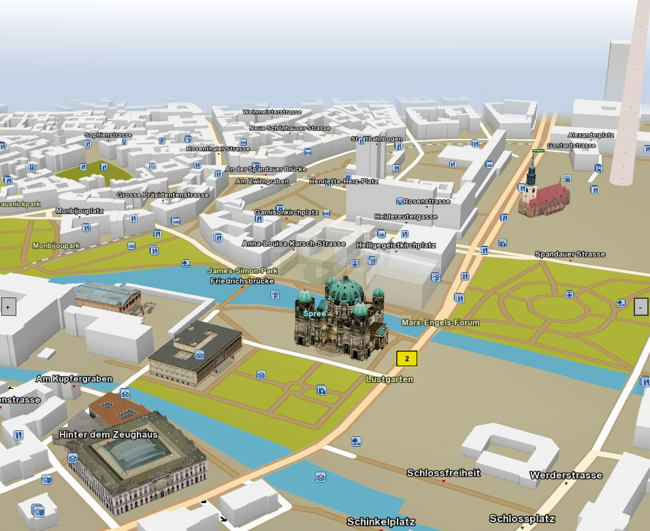 Similar systems, however, have been around for some time: In December 2007, the fire brigade was called to the site of a heavy accident in Deutz, a part of Cologne in Germany. To the presumable astonishment of the firefighters, the accident turned out to be a crash test of the local TÜV (Technical Inspection Association) for which the test engineers had forgotten to disable the emergency call system. 9. The last cassette deck in a car was sold in 2010, in a Lexus. 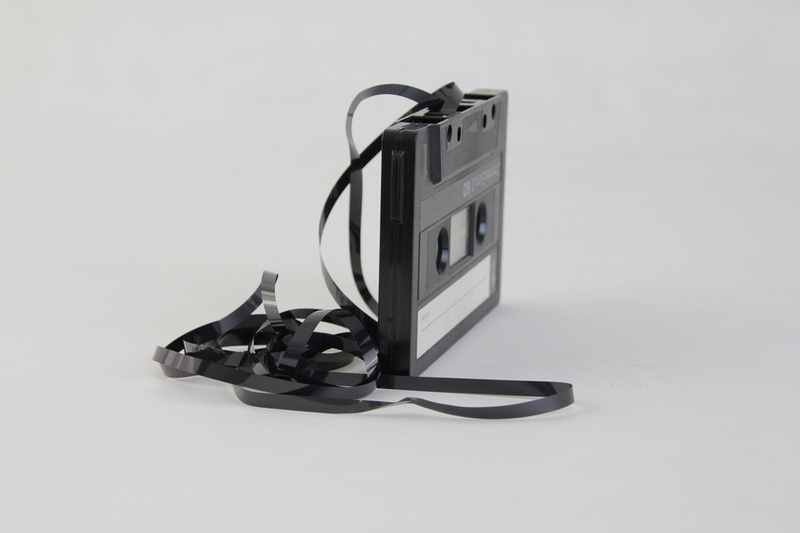 Few will miss the fiddly disentanglement of tape after a system hiccough or the use of a pencil to rewind that made listening to music such a hands-on experience. However, the compact cassette is what really brought our own music into the car, being much handier than 8-track tapes and decidedly less vibration-sensitive than vinyl. Cassette decks were widely built into cars from the 1970s until well into the 1990s until they eventually had to succumb to CDs and MP3 files. And what’s next for automotive infotainment and HMIs? Well, customers want more: according to a 2014 study, 80% of consumers want their future cars to provide the same connected experience they already know and appreciate at home or with their mobile devices. So whatever future technologies will enable, we can be sure to expect some interesting features! 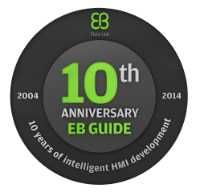 EB GUIDE is celebrating its 10th anniversary this year. EB GUIDE is EB’s tool for developing human-machine-interfaces (HMIs), the touch points where interactions between humans and machines occur. When the first version was introduced in 2004, monochrome displays with low resolutions were common and infotainment functions were very limited. (Discover this then state-of-the-art project for 2007 and 2008 cars.) Now at version 5.5, EB GUIDE embraces new technological possibilities like 3D graphics, speech technology and apps in the car. It is used by major carmakers and suppliers around the world, so chances are high that your communication with your car is based on EB GUIDE. But what exactly does it do? EB GUIDE is the combination tool for user interface development, so to say. It can be used during the whole development process. EB GUIDE helps to specify HMI concepts at an early stage. It supports software developers in handling large-scale HMI projects with complex menu structures and user interactions. It also allows the adaption of one system for different countries, regions and car model variants. With EB GUIDE, you can bring HTML5 and cloud content into the car. This means that the infotainment system can be enriched with up-to-date, app-like content, for example with the latest navigation data. Apps that we know from our smartphones may provide content for our infotainment system and connect us with the world outside. To make sure the driver isn’t distracted from driving the HMI will manage this third-party content and display it when suitable. Modern cars come with a variety of ways for human-machine-interaction, like multi-touch and gesture control, knobs and natural language interaction. These have to work together seamlessly within and across applications – for example, you could tell your car to show gas stations near your route and then select your favorite from a list by turning a knob. EB GUIDE provides the basis for integrating these options into one smooth user experience. User interfaces are an important factor to distinguish between brands and even car lines within a brand. Instead of developing a system from scratch for every car model, EB GUIDE allows carmakers to use one core HMI system across all brands and car lines while adding a unique user interface for each. Carmakers can save time and effort, both for development and for updates during the vehicles’ lifecycle. … and it’s not just for cars! There are much more applications for human-machine-interfaces than just cars. And whilst EB GUIDE was designed for automotive, there is no reason why other industries shouldn’t use the software to create reliable, easy-to-use user interfaces. One great example are these industrial measurement devices, or check out this (German) article about complex HMI projects. HOW TO COMMUNICATE EFFICIENTLY WITH CARS? Buttons, touchscreens, gesture and voice control – meanwhile there are many different ways to communicate with our cars. But what is the best way to communicate with them efficiently and safely? Check out our new HMI TechPaper in which we examine common and future multimodal operating options , from push buttons versus speech dialog, to gesture control, and evaluate their characteristics, advantages and challenges. CHAT AWAY WITH YOUR CAR – IT WILL ANSWER! Natural Language Understanding helps you keep your hands on the wheel and eyes on the road. Besides using pedals and a steering wheel, we use all sorts of ways to tell our cars what we want them to do – we push buttons, turn knobs or use touchscreens. But these approaches all have one thing in common: they require us to take one hand off the wheel and at least one eye off the road. As such, voice control looks like a great option to safely interact with your in-car systems. We probably all remember the first voice command systems, those that had us talk to them like to a stubborn teenager (“Get – home – now!”). This technology has advanced tremendously over the years. 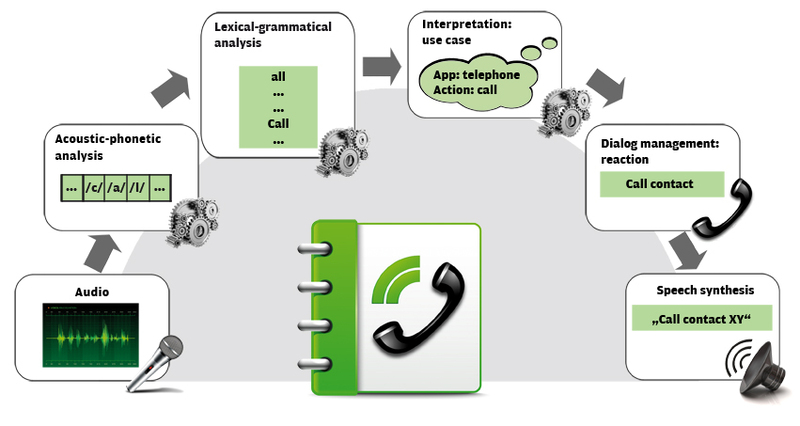 We now have Natural Language Understanding (NLU) systems that we can interact with as if we’re talking to a friend. The latest example of this technology is the Virtual Cockpit in the new Audi TT Roadster. Its NLU system has been developed and integrated with the help of speech dialogue and HMI solutions by Nuance and Elektrobit. But how does NLU work? Because talking comes so easily to us, we tend to overlook what an amazing capability communication through speech really is. The NLU system has to be able to understand not just your language, but also your dialect and possible input in other languages (like song titles or foreign destinations). It also has to distinguish the individual words that we pack into one uninterrupted sequence of sounds (because we don’t say “I – want – to – call – Amy”, we say “Iwannacallamy”), and the variety of grammatical concepts that we use each day, like questions, commands, wishes and intentions. And in the end, it has to give some kind of answer. NLU usually does this in three steps. First, the speech input is broken down into its smallest acoustic components – phonemes – which are similar to syllables. The system identifies the most probable sequence of phonemes (i.e. words) with the help of phoneme dictionaries. Secondly, the sentence structure is identified through a process similar to a grammar analysis. And finally, this is followed by a semantic analysis, where statistical data is used to identify the most probable intent based on sentences hypotheses. If a further dialog step is required, e.g. a question to clarify details, the system creates it basically by reversing the former process and synthesizing the answer into sound. A connection to the cloud helps your car with access to more computing power and bigger, continuously updated databases. Amazingly, this whole process happens within a split-second – so let’s get ready to chat with our cars! The story of EB GUIDE started when EB Automotive´s precursor 3SOFT was responsible for developing the HMI for a new car model in an automotive project. At that time the idea was born to create a software tool which would simplify and shorten the HMI development process by modeling HMIs workflows with a state machine. Based on three diploma theses of working students, “GUIdeDE” started in 2004 as in-house tool for the development of Graphical User Interface Design and was used for a real HMI project for the first time. Due to the strong demand it soon became a commercial product and was constantly improved and largely extended since then. EB GUIDE became multimodal and users nowadays can develop compelling graphical and voice user interfaces, as well as touch and gesture operating procedures with it and deploy it on their targets. Today numerous leading car manufacturers worldwide are using EB GUIDE for their HMIs and there are around 20 million targets on the road with EB GUIDE technology inside. Happy 10th anniversary, EB GUIDE! And the success story still goes on, stay tuned in the next 10 years with EB GUIDE.